Staff Recommends @CMPL: Phil recommends "The Kelloggs: The battling brothers of Battle Creek"
Phil recommends "The Kelloggs: The battling brothers of Battle Creek"
Michigan history buffs will love this story of two extraordinary brothers - John Harvey Kellogg, health guru and founder of the Battle Creek Sanitarium and William Keith Kellogg, founder of the Battle Creek Toasted Corn Flake Company. John Harvey’s sanitarium was legendary, with clients such as Mary Todd Lincoln, Amelia Earhart, Booker T. Washington, Dale Carnegie, Henry Ford, and John D. Rockefeller, Jr. William Keith’s cereal company became a household name and influenced how Americans started their mornings. 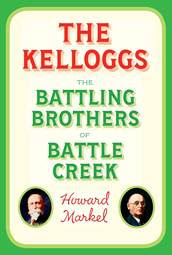 The Kellogg brothers’ animosity toward each other was as epic as their accomplishments. I particularly enjoyed this book because I was born and raised in Battle Creek and my grandpa used to work for Kellogg’s and the Sanitarium – he carried Eleanor Roosevelt’s luggage! This book is appropriate for adults. Gretchen recommends "The Traveling Feast"
Connie recommends "The Girl Who Wrote in Silk"